Forget Arnold&apos;s Drive-In, the new hangout for Fonzie and the gang is at Milwaukee&apos;s Riverwalk. 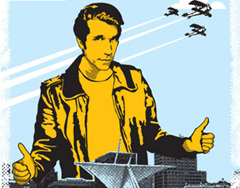 Former cast members will join Henry Winkler for the dedication of a new life-sized statue that immortalizes “Happy Days” star Arthur Fonzarelli at its permanent home on the Riverwalk in downtown Milwaukee. Dave Fantle from Visit Milwaukee.org says he has gotten such positive feedback for this statue because despite his fame, Winkler remains very grounded and continues his humanitarian efforts. Fantle explains the Bronze Fonz depicts the classic Fonzie pose. Just as important as the statue, is its background, Fantle says, in order to maximize the photo opportunity. The statue comes at a cost of about $85,000. The day&apos;s celebration includes a parade, autograph signings and a special pre-Brewer game ceremony with the cast of the 1950s-era sitcom. Dave Price from the CBS “Early Show” will do segments with the Happy Days cast live from Miss Katie&apos;s Diner on Tuesday morning from 7-9am. The day-long celebration will conclude when Henry Winkler and his cast colleagues are honored at a pre-game ceremony at Miller Park prior to the Brewers game. The cast will throw out the first ball and Anson Williams (Potsie) will sing the National Anthem. A commemorative bronze the Fonz baseball card will be given to every fan that attends the game.